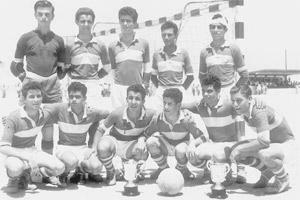 Little Rainbows, Minor League Section winners in season 1954-55. One of the earliest recollections I have of my childhood is that of a long line of people going up the stairs leading to the Schreiber Sports Ground at Tal-Borg Street, in Paola. Having been brought up in that street, my childhood and teens are inevitably intertwined with the history of the famous old ground. In those days, Sunday was the day reserved for football. The ground, usually so quiet and forlorn during the week, came to live and was transformed into a bee-hive of activity during the weekend. From early morning to early evening, rain or shine, games were held without interruption. All day long, thousands of spectators walked their way up and down the stairs, laughing or cursing, depending on their mood and the result of the match that had just ended. The fifties were the grand old days of Maltese football, particularly for the Schreiber Sports Ground which sadly will soon be pulled down to make way for the re-development of the area. The old ground conjures up many fond memories for those who like me lived during that golden period of its history. On Sunday mornings, I used to wake up early to attend the 6 a.m. mass so that I could be at the ground well before the people start to arrive for the first match of the day at 8 a.m. Admission was one shilling (five cents) which was more than my pocket-money for the whole week. However, if I arrived early I could perhaps persuade the ground attendant to let me in free of charge. Guzeppi Ic-Combos was a surly old man with a fiery temper who was not averse to setting his dogs on you if you tried to cross him. However, we learned to read his mood and he usually would turn his back and pretend not to see us sneak into the ground. Then, a glorious morning of football would follow. I watched every game avidly, and in time I became something of an expert on football in the lower divisions. I knew all the pros and cons of the Third Division teams and I could name all the players who performed in the lower divisions and youth football. Each season had its own thrills and spills and I can still remember some of the events of that period. 1954-55 is one season which still sticks in my mind. Little Rainbows of Tarxien were one of the best teams in the Third Division. They started the season on a top note, winning their first four matches without conceding a goal, but then lost 0-1 to fellow contenders Zebbug Rangers. Rainbows could have still saved the game and won their section had they not missed a penalty in the dying seconds of the match. Zebbug won section honours but failed to beat Zejtun Corinthians in the Championship decider. After a three-year absence from the Stadium, the Corinthians received due reward for their efforts and made a quick return to the Second Division. Thousands of people watched the two promotion deciders. The first game ended in a 2-2 draw. In the replay Zejtun emerged worthy winners by two clear goals. Apart from the Third Division Championship, that season the ground hosted also the Third Division Cup. This was a long drawn-out battle between 32 teams which, apart from the Third Division teams, included the Reserves of the First and Second Division teams. At the end of the competition, Valletta III beat Hibernians III 2-0 in the final in front of a bumper crowd which nowadays would do credit to the Premier Division. Then, there was the Minors League which also drew huge crowds to the Schreiber. The photograph which accompanies this article shows Little Rainbows, winners of Section C of the competition with maximum points from six matches. Unfortunately, the names of the players in the photo are not available. If there is anyone from Tarxien who recognises any of them, I invite him to write and share such information with me.